I have a bit of a cold and haven't sewn for a few days. I did finish up two more cloth grocery bags on Friday, and yesterday I helped my son and his neighbor friend, who just got back from a summer away, sew up some pillows. The friend made a 4-patch front panel and my boy just made his out of baseball fabric. I'm not even sure exactly what I want to make next. I should work on baby quilts. My nephew was born a week ago and I am still not even sure what I'm going to do for his quilt. I have some ideas though, I think it will be a lot different from what I normally make. 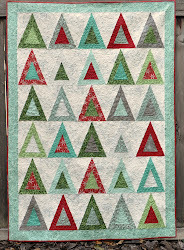 And I have the scrappy log cabin quilt to continue working on as well. I guess I'll be making a trip to the fabric store this week. Maybe the quilt shop too. I also have a dress cut out for the neighbor girl who's turning 2, and thinking about making a skirt for her 3-year-old sister. I might size down the pattern I want for her since it starts at 104 and she's probably a 98 or 92.